(without stand or speakers) 20.3" x 13.3" x 1.7"
Introducing the new E-series slim frame design. The VIZIO 22” Class Razor LED™ HDTV is shattering the mold in a way only VIZIO can, with high-quality design and picture at the best value. Enjoy crystal-clear action and eye-popping images in 1080p Full HD resolution. A slim frame design with ultra thin profile makes this a stunning centerpiece in any living space. 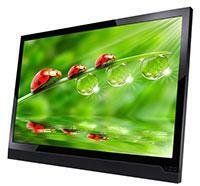 Plus, this LED HDTV is more energy efficient than a conventional LCD TV*, to save you even more money.